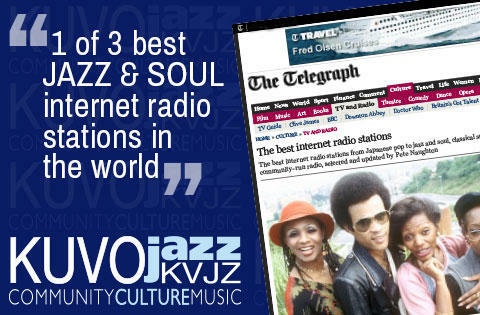 Denver’s own KUVO 89.3FM public radio station was named one of the best Internet jazz radio stations worldwide, by Pete Naughton a writer for The Telegraph, one of the United Kingdom’s’ top media outlets. Naughton, who writes for their podcasts and internet radio columns, listed KUVO as one of the top three best “Jazz & Soul Internet Radio Stations” he’s discovered across the world. Below, what he reported in his column, “Best Internet Radio Stations” online on May 26, 2014. "I stumbled upon this award-winning music station by accident recently – and have been kicking myself for not finding it sooner. Based in Denver, Colorado, its artfully-curated playlists mostly focus on jazz – broadcasting everything from Ella Fitzgerald through to Madeleine Peyroux. A class act." KUVO serves a culturally rich, diverse audience that loves jazz – all styles of jazz. Our station’s line-up on air and in the studio reflects the flavors of jazz from around the world. You want Latin jazz, Afro-Cuban jazz, jazz funk, jazz fusion, soul jazz, any jazz – we’ve got it. We celebrate jazz talent from old to new and local to legendary. It’s what makes our station unique. See coverage here from 9News. KUVO/KVJZ is an independent, public radio station dedicated to providing distinctive music, news, and information programming which reflects the values and cultural diversity of its listener community. KUVO/KVJZ has served the community since 1985 with jazz, blues, news and a weekend lineup of culturally rich diverse programming. The station is on 89.3FM Denver, 89.7FM Breckenridge, 88.5FM Vail and online at kuvo.org. Each week, nearly 900,000 people throughout Colorado turn to Rocky Mountain PBS to discover inspiring local, national and international programming; find diverse viewpoints; score front row center seats to world-class performances; and experience lifelong learning opportunities. Rocky Mountain PBS celebrates its 58th anniversary on the air this year. The network began in Denver in 1956 as Colorado’s first public television station. It is now Colorado’s only statewide television network, with stations in Denver (KRMA), Pueblo/Colorado Springs (KTSC), Steamboat Springs (KRMZ), Grand Junction (KRMJ) and Durango (KRMU). To learn more, visit rmpbs.org. For more information please contact, Tina Cartagena, Chief Revenue Officer, KUVO/KVJZ at 303-446-7612 or tina@kuvo.org. To support public radio KUVO click here. Thank you! Follow Up Buzz: On a recent trip to the UK, Morning Beat Host Victor Cooper snagged a pint with Pete Naughton, reporter for The Telegraph UK who named us “1 of 3 Best Jazz and Soul internet radio stations”. Bonus cool factor? They are BOTH sportin’ KUVO T-shirts! #JazzMessenger Tune in now or 9-12/M-F for Victor’s straight ahead jazz playlists.